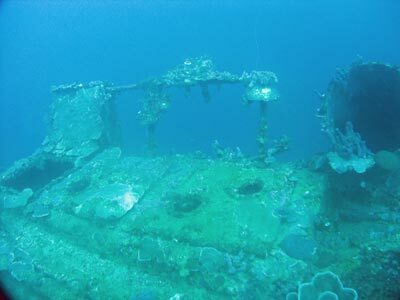 The shipwrecks of Chuuk (Truk) Lagoon fall into two categories, those that sit on a bottom of more than 45 metres and those under 35 metres deep. 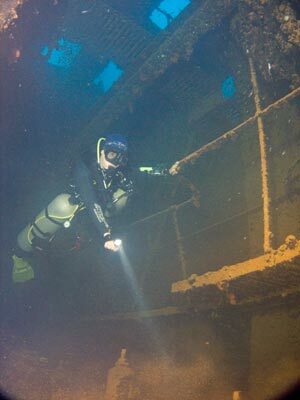 As there are many more of the over 45 metre deep wrecks, a diver who visits for the normal week only gets to do about a maximum of six of these wrecks. 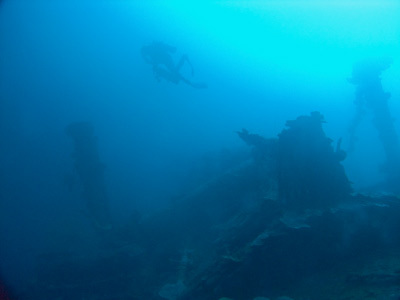 There are almost 20 of the deeper wrecks, so you can see that most people do not get to visit the vast majority of these wrecks. 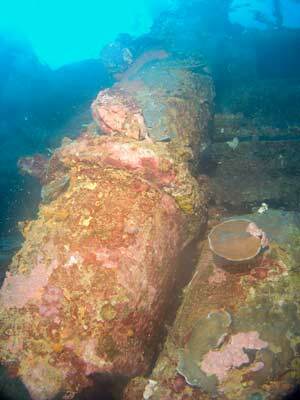 One of the deeper wrecks is the Nagano Maru. 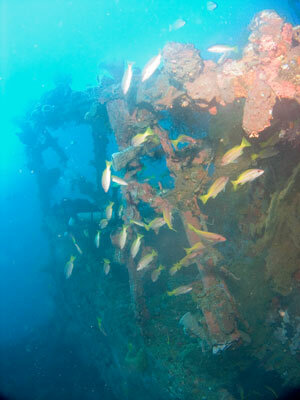 This is not visited all that often as the more famous wrecks are the ones that guides tend to take people to. The Nagano Maru was built by Mitsubishi Heavy Industries in Japan for Nippon Yusen Kaisha. She was launched on 25 April 1917 and entered service on 21 May 1917. The new ship was 105.16 metres long and had a beam of 15.24 metres. She displaced 3,810 tons and was powered by a coal powered steam engine. Unlike most steam engines of this era (which were triple expansion steam engines), this new vessel had a quadruple expansion steam engine. See later for an explanation of this. 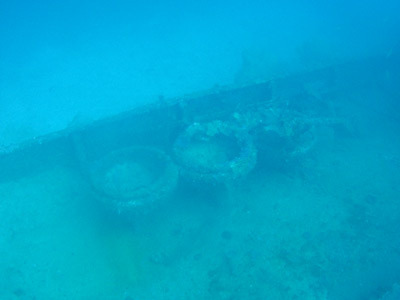 The engine pushed the Nagano Maru at a maximum of 14.3 knots and a cruising speed of 11.0 knots. The Nagano Maru was a four hold freighter, with two holds fore and two aft. She mostly served within Japan and was taken over by the Japanese Army on 12 September 1937 to use as a transport when Japan attacked China. On 12 December 1937 she was returned to Nippon Yusen Kaisha and she again served in her normal role. On 16 June 1941 the Japanese Navy requisitioned the Nagano Maru and used her till 10 September 1941. It is not known what she did from this time till 27 December 1941 but it is likely that she was being repaired or modified with armaments. A year later on 27 December 1942 the Nagano Maru was made an auxiliary transport and was now under the command of the Army. The Nagano Maru arrived in Chuuk in mid-January 1944 and departed soon after with supplies for the airfield at Morotok (no idea where this is as I can find no reference to it on the internet). She returned on 22 January 1944. On 17 February 1944 the Nagano Maru was anchored to the east of Eten Island, only a few hundred metres east of the San Francisco Maru. 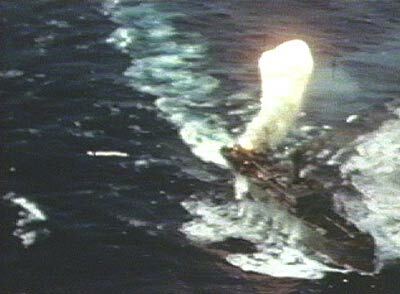 During the attack by US aircraft operating from aircraft carriers outside the lagoon (Operation Hailstone), she was attacked by bombers from USS Essex during the first wave of planes. This started about 6:30 am or 6:45 am. There were four near misses and fires were started in Hold 1 and Hold 3. The fire in Hold 1 was bought under control but the fire in Hold 3 spread. The hull started leaking, probably as a result of small splits in the hull caused by the near misses and the fires. At 7:35 am the Captain died from injuries from a near miss. 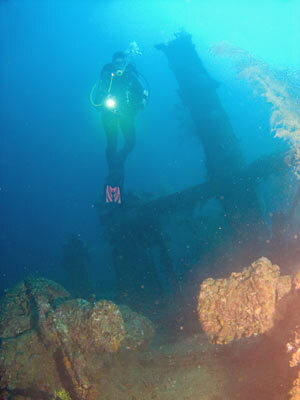 At 9:00 am the crew abandoned ship and the Nagano Maru sank about noon on 17 February 1944. Today the Nagano Maru is located at GPS Reading N7º 21' 57.5" E151º 54' 52.0" using WGS84 as the datum. This will put you near the bridge which is where the guides normally anchor. The Nagano Maru has a slight list to port. 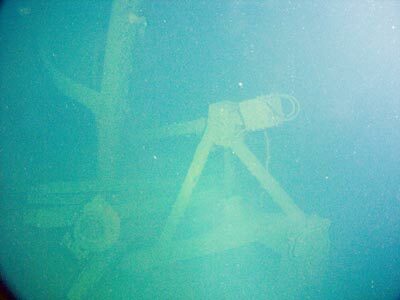 As you descend to the bridge (45 metres) you will see that the funnel has collapsed to the port side. There are skylights here and one gives access to the engine room. The rear ones on both the starboard and port sides are wide open and you can fit through them even with twins. It is an easy drop down into it. It is not a huge engine room, there is really only room for a couple of divers at a time, as long as one keeps above the other. 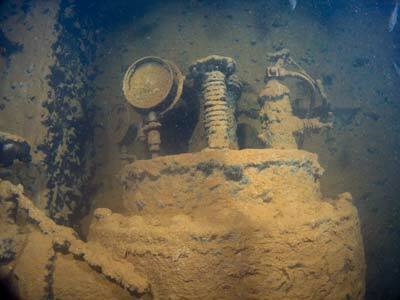 As mentioned above the steam powered Nagano Maru has a really different engine. While triple expansion steam engines are very common (for example the SS Tuggerah in Sydney), this is a quadruple expansion steam engine. This means that the steam first comes into a small diameter cylinder at higher pressure, then exits after it has pushed the piston through a half stroke and goes into a larger cylinder. As it is at a lower pressure, having exerted some of its energy, a larger diameter is required to make the power from this cylinder the same as the first cylinder. This is repeated with the steam then going into a larger again cylinder and then an even larger one. This method extracts the maximum power possible from the pressurised steam. Quite unique from a diver's point of view, I have never seen another one like this. There are also some gauges in the forward port top corner. The depth in here is about 54 metres. You can exit out of the engine room via a door on the port side. This means you do not get a traffic jam and other divers in your group can follow behind. The door opens into a large passageway. Turn left and at the rear there is a door that comes out on the deck behind the superstructure and forward of Hold 3. Hold 3 does not have much in it, but there are two large propeller blades attached to the forward bulkhead on the first tween deck. There are some other objects on the bottom of the hold at the rear. I could not figure out what they were, but looking at the photograph I took it is possible that they are bulldozer blade attachments. Hold 3 is about 59 metres at the bottom. 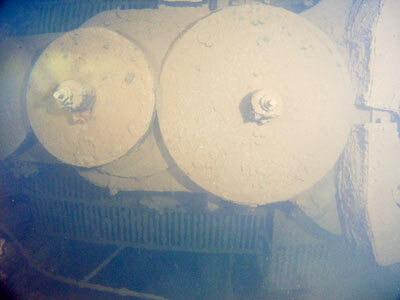 On the port side of the deck adjacent to Hold 3 there are three objects that resemble huge woks or cooking vats. It is speculated that they are indeed cooking implements. Between Holds 3 and 4 there is a mast and some winches. The mast has broken off about 5 metres from the deck and fallen away. Hold 4 has hundreds of 200 litre drums all over it. They are on the tween decks as well as in the hold itself. 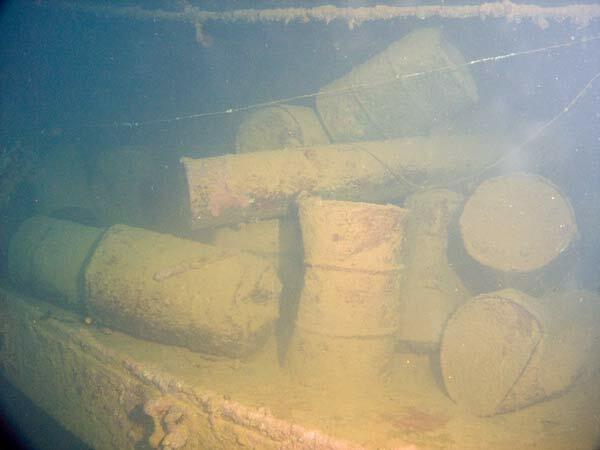 These were full when the ship sank as they are not imploded. They must have contained a black oil as when we were doing decompression, a lot of small globules of oil came floating up with bubbles of air. 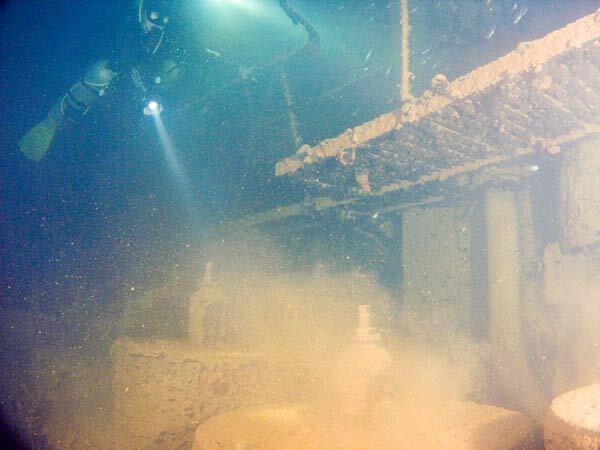 I suspect that the oil accumulates in the upper corners of the hold and when divers' air hits it, it pushes small amounts of the oil out and they very slowly ascend. The oil appears to evaporate as soon as it hits the surface and even attempting to hit it with your hand does not cause your gloves to be dirtied. It is also 59 metres in the bottom of this hold. There are also some other objects in Hold 4. 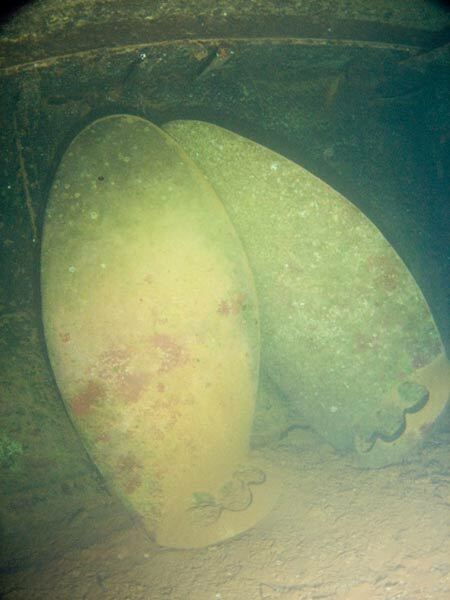 They are long and cylindrical, but are not torpedoes. See the attached photo of drums which has one. If you have any idea what it is, let me know. I did not go to the stern as we were running low on bottom time. Head back towards the bridge on the higher starboard side. This is about 50 metres. You can go through the upper levels of the superstructure to the bridge. On the bridge, the telegraph has fallen over but can still be seen one level down from the top. It will now be time to ascend. 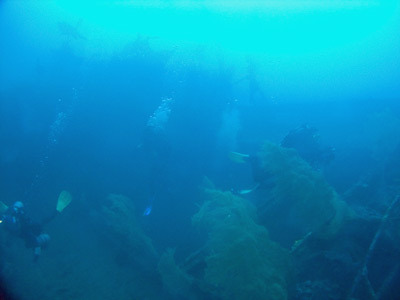 This is another excellent shipwreck, with visibility normally in the 30 metre range. Worth doing if you are here for more than 10 days. For a bottom time of 17 minutes you will do about 24 minutes decompression.